I've been really into shopping for tops lately. I don't know what it is, but I really don't tend to get that excited by pants or skirts. To me, a pair of jeans is a pair of jeans and it's what you wear on top that makes it a little more exciting. Everyone here seems to have really good luck at Urban Outfitters, so I took a quick look at their website the other day. It's not my usual place for finding lots of clothes, but I was so surprised by how many things I wanted to add to my wishlist! 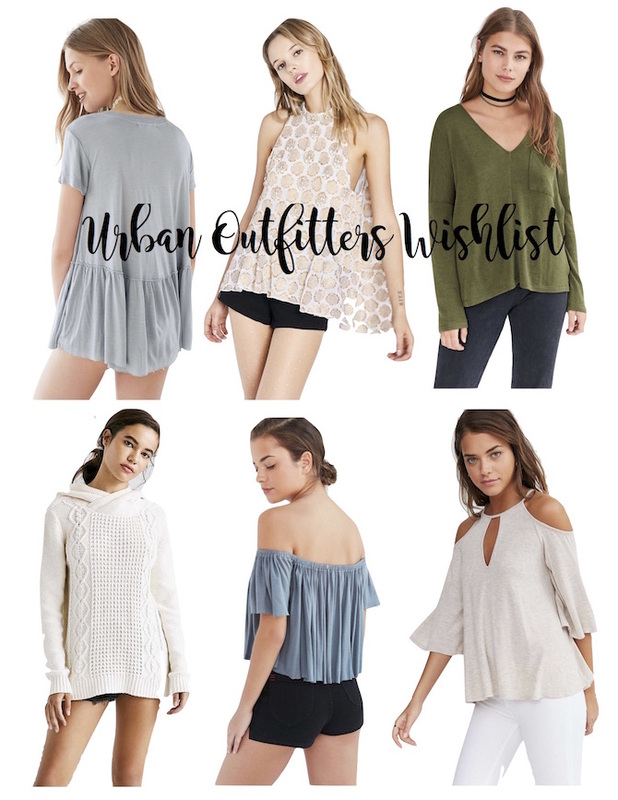 I put together a little collage of fun tops I found and think they would be perfect for any college girl (now if only I had an unlimited budget :). I actually have the peplum tee and I love it! It's so easy to wear and I get lots of compliments on it when I wear it. Highly recommend! I love the gray top with the ruffled peplum hem, it's really casual but the ruffle dresses it up a little bit! The peplum tee is the cutest tee ever. I actually just bought a similar tee from Old Navy yesterday for way cheaper.